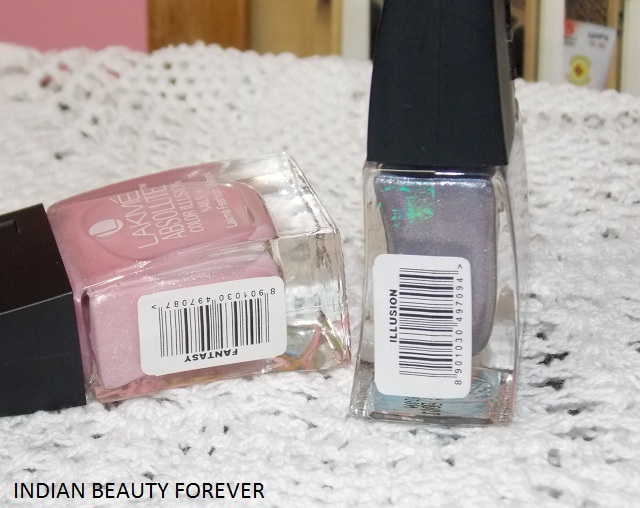 Back with a nail paint review! Lakme Absolute Color Illusion range has some really gorgeous colors and After Lakme Color Illusion fantasy, I will review Color Illusion in ILLUSON. (Woh, So many Illusions!!) By the way, I loved the names of the shades in this range. At least better than the numbers that the Lakme Color Crush nail polish range had, but still that range is my absolute favorite with beautiful trendy colors and smooth as satin texture. Coming back to illusion here. ILLUSION is a very pretty, sultry smoking grey with green and lavender glitters that aren't chunky yet adds a drama and dimension to the beautiful grey base. I have liked this color more than the fantasy as pale pinks are not for me. This beautiful grey when packaged in a classy and alluring square bottle, makes it even more appealing. It's a color that I would wear with black or white outfits, especially during the evenings. It isn't one stroke wonder through with 2-4 coats it gets quite opaque to bring out the true opaque color. Smell is a bit too much, but that's okay as it goes off after 5-6 minutes. The nail paint streaks a bit as you can see in the pictures, this can be a slight low feature of this polish but i have noticed that as the color is on the darker side, the streakiness isn't too obvious as in with the fantasy. The high point of this nail paint would surely be its staying span as it stayed for 5 days with just the slightest chipping from the edge of the nails and that's it!! It stayed in total of 7 days, after which I changed it as the chipping was more. 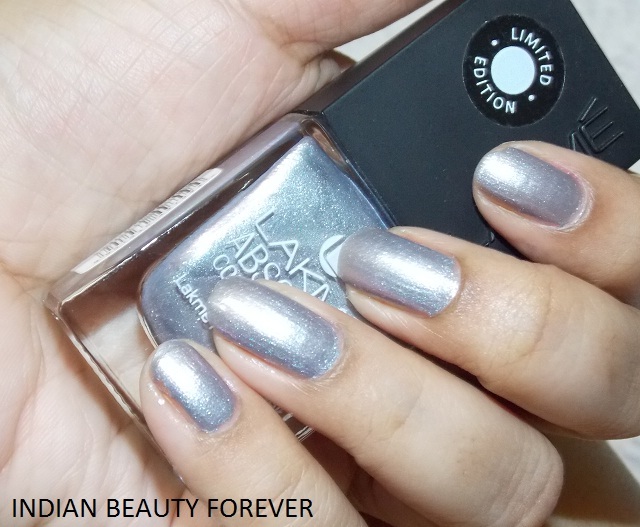 All in all, I find this Lakme Absolute Color Illusion Nail Paint color to be stunning with a good staying time. Very pretty polish. I missed your beautiful nails. I would love to see some beautiful nail arts too, I know that you're very talented! Grgs shades. ..lovely clicks ..